Researchers have marked Australia’s first foray into space in 15 years, after receiving a signal from a tiny satellite launched just two weeks ago. The INSPIRE-2 satellite was launched into space from the International Space Station in early June, and now an audio recording of the 20 cm-long satellite’s signal has been detected. Project leader, University of Sydney Professor of Space Physics Iver Cairns, said detective work to locate and communicate with the pioneering spacecraft was a result of around-the-clock collaborative work by the University of New South Wales and Australian National University and an international group of radio enthusiasts. “INSPIRE-2 is alive in space and in good health,” Professor Cairns said. The signal was detected after weeks of sleepless nights, detailed analysis, and strong international engagement by experts and enthusiasts. Together with radio amateurs across the world, the Australian National University’s Mr Dimitrios Tsifakis and the University of Sydney’s Tony Monger, listened and transmitted commands to the CubeSat at all hours of the day and night for many days. Finally, on Sunday, radio amateurs from the Netherlands, Spain, the US, and Australia detected INSPIRE-2, followed by Mr Tsifakis. “The beacon signal contained the satellite name and parameters such as the battery voltage, charging current, and temperature. The initial contact involved reception of the beacon signal and was a very simple message exchange, consisting of a confirmation that the satellite can receive signals from and send them to our ground station,” Mr Tsifakis said. 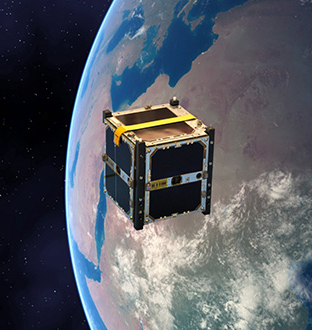 The cubesat is part of the international constellation project QB50, which celebrated its lift-off from Cape Canaveral, Florida in April 2017 and its deployment into space in late May 2017. The news comes a week after the Australian Research Council awarded $4.6 million for a Training Centre for Cubesats, UAVs [Unmanned Aerial Vehicles] and Their Applications.